Individuals vary in their response to disease: how tolerant they are to infection, how quickly they clear infections, etc. Some individuals, called super-spreaders, are particularly good at transmitting disease because they have high contact rates with susceptible hosts and/or are highly infectious. 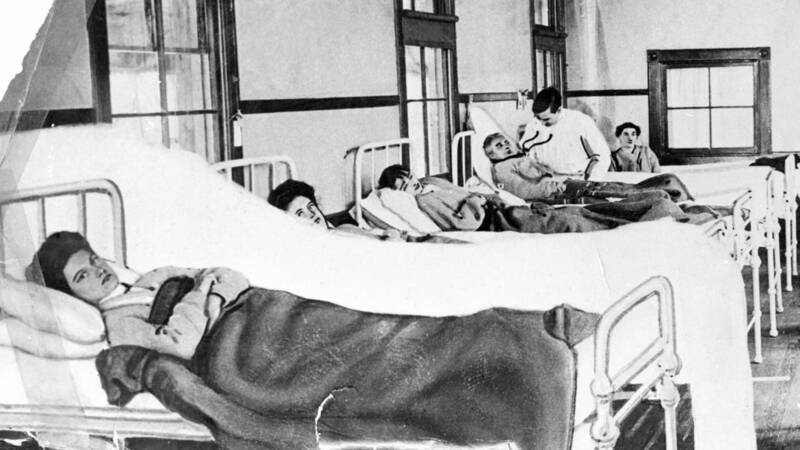 Mary Mallon – aka Typhoid Mary – in the hospital. She’s the posterlady for super-spreaders. Credit: Wikipedia. What causes an individual to be a super-spreader? Lass et al. (2012) explored the possibility that super-spreading might occur when hosts are co-infected by multiple parasites. Specifically, they looked at whether co-infection of mice with a microparasite (respiratory bacterium Bordetella bronchiseptica) and a macroparasite (gastrointestinal helminth Heligmosomoides polygyrus) created mouse super-spreaders. They did a laboratory experiment with four mouse treatment groups: bacteria-infected only, helminth-infected only, bacteria and helminth-infected, and control. During the experiment, bacterial load was quantified by “bioluminescence imaging.” That’s right. Parasites that glow. (These parasites also allow for the use of fewer vertebrate animals in research!) Helminth infection was quantified by egg output in the mouse feces. Having done the latter, I envy the former. We need to engineer some bioluminescent helminths! Lass et al. (2012) looked for animals whose egg output or bacteria load were two standard deviations above the mean. They found that in co-infected animals, bacterial load and egg output were higher than in animals with single infections. Three out of ten of those co-infected animals had two-sd-higher bacterial loads than average (those mice had to be euthanized), and five of the seven that remained were helminth egg super-shedders. It looks like co-infection can create super-spreaders/shedders! Neat! So, should parasites try to end up in animals already infected by different parasites? That is, should parasites unite to create super-spreaders? Well… maybe. But mortality was higher in co-infected individuals in Lass et al.’s (2012) experiment, so there appears to be a trade off. And this doesn’t consider contact rates. A future question might be whether these co-infected individuals also have higher contact rates with other individuals. This entry was posted in Cool Literature and tagged disease, ecology, helminth, medical, parasite, super-spreader, superspreader, Typhoid Mary by dinoverm. Bookmark the permalink. It’s hard to find educated people on this topic, but you seem like you know what you’re talking about!